A sequence of ten photographs of the same caterpillar (larva) was put together for this image. It shows a monarch butterfly (Danaus plexippus) transforming into a chrysalis (pupa). These photographs were taken in our own back yard. It is not strictly a time-lapse series; the images are not taken at equal intervals. For this sequence, Nancy had the camera on a tripod with her chair in the garden, waiting six hours for something to happen. Her first clue was when the antenna went limp, sort of swaying in the breeze, as shown in second photo. This happened about an hour before the chrysalis was first visible. About a minute before the chrysalis first appeared, the caterpillar relaxed its "J" formation (as in third photo). When the slit finally appeared in the back of the neck (shown in fourth photo), things began to happen fast - the next two photos were taken within 60 seconds, and the two after that took another forty-eight seconds. The ninth photo was taken a little more than nine minutes after the slit, and the final photo represents the chrysalis as it would appear several hours later. 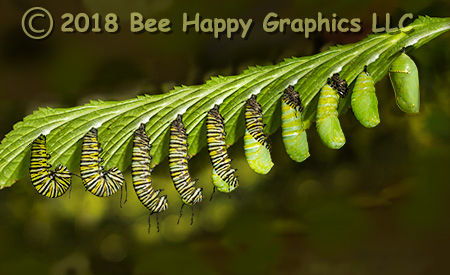 This is our second image showing part of the metamorphosis of a monarch butterfly, and is actually the prequel to Emerging Monarch. Life Cycle of Monarch Butterfly. Photographic details: The first nine images were taken with Nancy's Canon EOS 7D camera w/ EF 100-400mm f/4.5-5.6L IS USM lens set at 100mm. Flash was used. The camera was on manual exposure mode, set on f/8 for 1/250 sec at ISO 200. The last photograph was actually taken 26 months earlier with her Canon EOS 30D, using the same lense at 400mm. It was set at 1/640 sec on shutter priority, resulting in an aperture of f/20 at ISO 800. Flash was not used for this image. Fine Art Paper 10" x 16" 37" x 60"